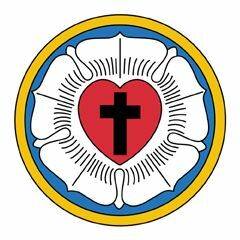 The Luther Rose is a popular symbol for Lutheranism. Click on the image to learn more. First and foremost Lutherans are Christians. As all Christians share the central beliefs of Christianity, so do Lutherans. Secondly, as all denominations become distinct through a unique emphasis of certain facets of the Christian faith and faith practice, so do Lutherans. The Lutheran emphasis, in a word, is God’s grace. Lutherans point to time-honored creeds throughout Christian history as faithful guides to what is central to the Christian faith. These creeds at their heart teach: God is Trinity, Father, Son, and Holy Spirit. God created the world. Jesus was the Word of God become human, born of the Virgin Mary. He was 100% God born 100% human, and was sent out of deep love for his people to die for us on a cross to forgive us our sin and redeem the world. He was raised from the dead bodily on the third day to make us his own through faith and promises his very indwelling eternal life giving presence to all who believe. He ascended to the right hand of the Father and will come again to judge the world, living and dead. Jesus sent his Holy Spirit to work out his plans for humanity both individually and collectively and gather his church, through which he continues to reach out to the whole world. All Christians believe these things formally or informally and find these things to be central. Lutherans are proud to first and foremost simply bare the name Christian. Different Christian churches, while being one in their basic beliefs, become distinct from one another in how they emphasize various facets of Christianity. For instance, Baptists emphasize the human response to the gospel through the altar call. The Methodist church was born from an emphasis on holiness. Pentecostals emphasize the supernatural power of the Holy Spirit. And so forth, each denomination emphasizes certain facets of faith and or faith practice. Christians are one garden. Each denomination is a different kind of flower in that garden. As different insects and birds are attracted to different flowers so different people are attracted to one emphasis or another within the Christian church. This is God’s design and should be celebrated. What do Lutherans emphasize? In a word, Lutherans emphasize God’s grace. The acronym God’s Riches At Christ’s Expense is often sited as a good working definition of this grace because it names God as the main subject and implies God is at work in the giving of himself in his passion on the cross and giving the riches of all the good he promises. This Lutheran grammar expressed as God as main subject doing active verbs permeates Lutheran understanding of grace and receives a strong emphasis in all our thinking and speaking about the faith. Our beginning was born out of this emphasis. Luther came to understand that it is God who justifies by his grace. “He saved us through the washing of rebirth and renewal by the Holy Spirit, whom he poured out on us generously through Jesus Christ our Savior, so that, having been justified by his grace, we might become heirs having the hope of eternal life.” Titus 3:5-7 Other basic important themes also are seen through this emphasis. For instance, sanctification is experienced by grace. “For the grace of God that brings salvation has appeared to all men. It teaches us to say “No” to ungodliness and worldly passions, and to live self controlled, upright and godly lives in this present age, while we wait for the blessed hope…” Titus 2:11-3 When speaking of faith Lutherans remember “God is the author of our faith.” (Hebrews 12:2) When speaking of good works Lutherans remember “God created good works for us to walk into.” (Ephesians 2:10) Lutheran preaching and teaching get constantly filtered through this lens of God’s grace. Christians in all denominations sometimes get stuck in their denominational emphasis. This stuck-ness can cause us to misunderstand each other or even distrust one another. For instance Lutherans have the opposite emphasis from Baptists. Baptists emphasize human response; Lutherans emphasize God’s actions. Lutherans and Baptists can then at times feel at odds with each other. This need not be. Remember, these are emphases, not mutually exclusive categories. Baptists certainly speak of grace and speak of what God does. And Lutherans speak of the requirements of the law in our lives and a faith response to God. Understanding each denomination’s emphasis can set us free to lift up and celebrate each denomination’s place in God’s plan in the world. We invite you learn more about the Lutheran rose planted in God’s garden. Learn about our history. Learn about Lutheran watchwords such as Grace Alone, Word Alone, and Faith Alone. Learn about the priesthood of all believers. Learn about Lutheran preaching of law and gospel. Learn why the gospel sets us free to serve our neighbor in a multitude of ways in God’s world without ever feeling like we are earning God’s love and favor by that service. Learn how God’s grace is powerfully experienced through God’s Word, in Holy Communion, and in baptism. Basic Lutheran confessions may be found in The Book of Concord. There is much to learn about all this. But know first and foremost that we want for you what the whole Christian church wants for you, to experience Jesus’ love for you that redeems and sets you free. We love our heritage of the Lutheran rose. At the same time we celebrate what God is doing in his whole garden.